The gentle sound of bees buzzing among the flowers: a favourite sound of Summer. But why do bees buzz, and how do they make that buzzing sound? Of course, we can't get into the minds of bees! But by observing their behaviours, we can make a few guesses. I looked into this subject using some of my favourite books about bees, as it's a question I have been asked whilst giving my talks. I found that theories and ideas had changed over time - no surprise there: history shows we form ideas about a thing, only to learn more and change our minds later! Firstly, buzzing is of course, commonly heard when bees are simply flying, during which time, the wings are vibrating very fast. But bees will also buzz at other times, and the tone of the buzzing may alter. For example, they seem to buzz more aggressively if their nests are disturbed, or if they are disrupted during foraging. They will also buzz more aggressively if attacked or defending themselves from predators, or during conflict with other members of the colony, such as the queen. If you have seen my page about bumblebee pollination you will have read that bumblebees are capable of 'buzz pollination'. 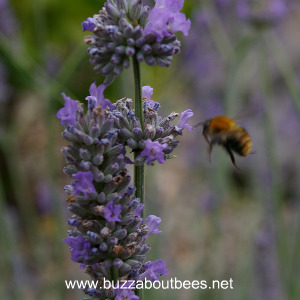 Of course, bees buzz from flower to flower, but whilst foraging, for a few seconds, they tend to remain quiet. Not so during buzz pollination. The anthers of some flowers (i.e. the parts carrying the pollen) only release their pollen if they are shaken. Bumblebees achieve this by placing the upper part of their body (thorax), close to the anthers, then vibrating their flight muscles very fast. At the same time, they make a lovely buzzing sound. Buzz pollination is especially beneficial for tomatoes and other fruits, resulting in a more abundant crop. One particular type of high-pitched buzzing sound made by honey bees is called 'piping'. Piping occurs directly prior to swarming, but can also occur during the disturbance of a hive. There are differing views about which bees in the honey bee colony initiate the piping prior to swarming. Some sources state that the queen starts first (Werner, 1964). Others state that the piping begins with a small group of experienced forager bees called 'nest-site scouts', who produce a "piping-signal" that primes the workers for swarming (Rangel, 2008). It is also now believed that when honey bees 'waggle dance' to communicate the locations of food (flowers upon which to forage) to other members of the colony, it is not only the movements of the honey bee, but also the buzzing sounds made, that convey the whereabouts of the forage sources (Goodman 2003). How Else Do Bees Make That Buzzing Sound? Back in 1912, a researcher called Sladen thought that the noise was caused by air passing over the edge of a membrane in tiny holes in the segments of the abdomen (these holes are called spiracles). "Whatever the truth of this, it seems that the buzzing sound made by bumblebees is at least greatly amplified by the vibration of the wing membranes". Quick snippets of information about bees, with links to further detail, as well as honey bee facts. This varies, depending on the type of bee and role within the colony. Why Do Bees Bump Against Windows? What Should I Do If I've Found A Bee? Go from 'Why Do Bees Buzz' to main introductory page about bees.